FeliX (Functional Enviro-economic Linkages Integrated neXus), a project of the International Institute for Applied Systems Analysis, is a system dynamics model of global social, economic, and environmental Earth systems. Critical interdependencies among these systems are incorporated to recreate the complex dynamic behavior which characterizes the Anthropocene . Jump to the blog discussing the FeliX model structure, uses, and results. See peer-reviewed and other publications using FeliX. Download the FeliX model to use in your research. Implemented in Vensim, the model consists of stocks and flows, the interactions among which are defined by coupled differential equations. 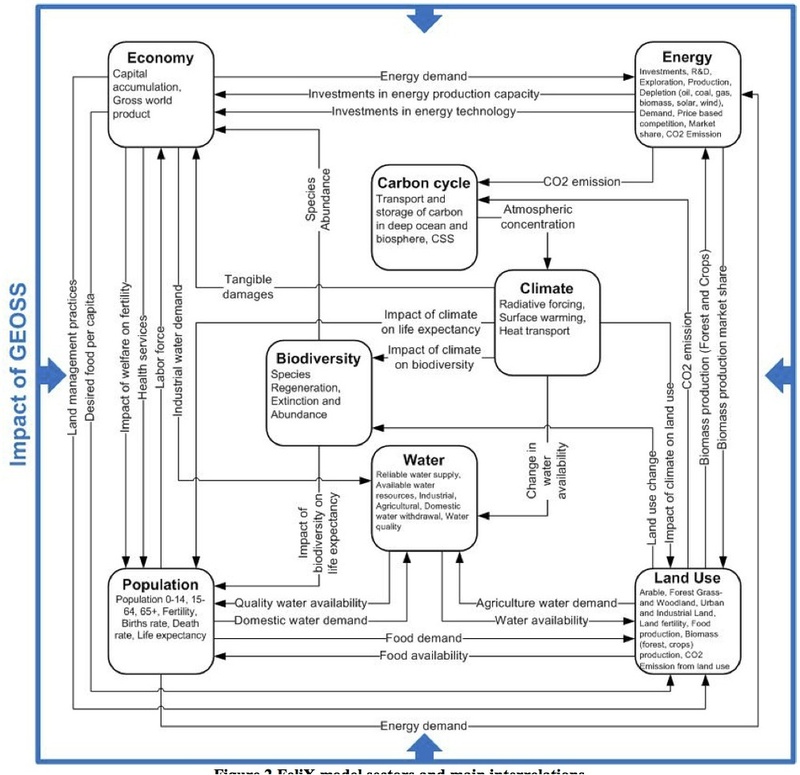 Flows define feedback loops which propagate impacts and integrate outcomes across the eight model sectors: Economy, Energy, Carbon Cycle, Climate, Biodiversity, Water, Population and Land Use. Elements of the model are calibrated to historical data [1900-2010] (as available) from the FAO, IEA, CDIAC, IPCC, World Bank, and UNIHP. After calibration, Felix scenario outcomes project on a global scale major stock changes (e.g., depletion of natural resources, accrual of carbon dioxide in the atmosphere) as well as the aggregate consequences of policies and technologies (e.g., afforestation, emissions reduction) over time. Independent historical data and future pathways are used to validate these projections. The baseline--or Business as Usual (BAU)--scenario was constructed as a reference for GEOSS for the purposes of global impact assessment. The definition, calibration, performance and outcomes of the BAU scenario are documented in detail in the DISCUSSION section of this website. FeliX model sectors and main interrelations. FeliX is a model that has been developed and applied in a team effort at IIASA over the course of several years and projects, led by IIASA/ESM research scholars Dr. Felicjan Rydzak and, subsequently, Dr. Brian Walsh, with significant foundational contributions from IIASA/ESM staff members Dr. Michael Obersteiner, Dr. Steffen Fritz, and Dr. Ian McCallum. Steffen, Will et al. “The Anthropocene: From Global Change to Planetary Stewardship.” Ambio 40.7 (2011): 739–761. PMC. Web. 18 Feb. 2015.